A first of its kind project in North America, the system processes renewable biomass to generate thermal energy for heating campus buildings. The system reduces UBC’s reliance on fossil fuels, provides a quarter of campus heating needs, and eliminates 14% of campus greenhouse gas emissions. In addition, a 2MW cogeneration engine uses Renewable Natural Gas to generate over 5% of the power for UBC’s electrical grid, while waste heat from the electrical generation process is also used for heating buildings. The BRDF is a signature Campus as a Living Laboratory project, integrating UBC’s core academic mandate of research and teaching with our district infrastructure, all within a facility that is a showcase for cross-laminated-timber products made in British Columbia (CLT). Operational since 2012, the $27.4 million facility processes two to three truckloads of ground and chipped waste wood daily, consisting of sawmill residuals, municipal trimmings and land clearing operations. Thermal Only Mode: produces 6 megawatts (MW) of thermal energy (steam) per hour. Thermal Only Mode uses commercially proven gasification technology to turn biomass into syngas. Biomass Cogeneration (CHP) Mode: produces 2.4 MW of thermal energy (heat recovery) and 2 MW of electricity. 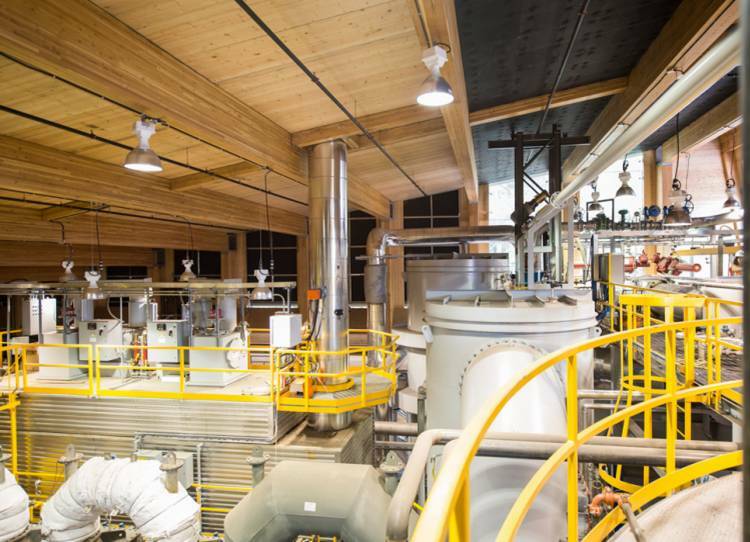 In CHP mode, raw biomass syngas is refined to produce an engine grade or clean syngas—using a custom made syngas cleanup technology—which is used by the BRDF engine. Visit the BRDF Frequently Asked Questions page for more details on each operating mode. The BRDF initiative began in 2009 as a partnership with UBC Operations, faculty members, students, researchers, and key industry partnerships with BC Hydro, Nexterra Energy Corporation and GE Power and Water, a leading developer of green technology. The facility is one of the first buildings in North America to be constructed from Canadian produced Cross Laminated Timber (CLT). CLT is a new wood building material that can be used as a low carbon, renewable alternative to steel construction. The BRDF’s location near the Marine Towers student residence was strategically chosen to show that facilities of this kind can exist safely in high density urban environments. The BRDF has demonstrated that the cleaner the fuel source is, the cleaner the emissions are. A real-time ambient air monitor has been installed in a nearby building to ensure emissions from the facility remain at safe levels for the surrounding buildings and residents. The monitor provides alerts if air quality limits are exceeded. Air emissions from the facility have fallen well below permitted emission limits to date. The latest development at the BRDF is the use of Renewable Natural Gas (RNG). When syngas is not available, RNG fuels the cogeneration process as a complementary fuel source to syngas. RNG is classified as a biofuel, the same as biomass. The RNG cogeneration dual fuel project was commissioned by UBC in July of 2014. The use of RNG allows operators to maximize the thermal and cogeneration modes of operation at the same time. The BRDF can now produce up to 8.4 MW (thermal) and 2MW (electricity). The facility will provide a positive return on UBC’s investment by 2028. The BRDF will generate over $800,000 in operational savings annually, which will be used to pay down the University’s $8.15 million contribution to the overall project over 15 years. Learn more about the BRDF in the Frequently Asked Questions section or read the Clean Energy Fund Report below.